There are various people who are enthusiastic about iPhone since it released. They update their device once the Apple Inc. published a new brand; they upgrade the iOS system when a higher version is available. Some even jailbreak their device to experience more functions. However, just as the saying goes “touch pitch, and you will be defiled”, many people have encountered iPhone stuck screen after iOS update, jailbreak or restore. Others also reported their device stuck in DFU mode, recovery mode or Zoom mode. Here we list the top 10 iPhone stuck issues and introduce you the best iPhone care software-Tenorshare ReiBoot to help you fix all iOS stuck permanently. iPhone stuck in recovery mode is one of the most serious circumstances after a failed iOS upgrade, terribly jailbreak or iTunes restore. You can see a "Connect to iTunes" logo and cannot do anything with your device. Normally you can perform a force restart by holding both Power button and Home button, or use iTunes restore to fix iPhone stuck in recovery mode. But both of these methods cannot guarantee a 100% successful repair. Sometimes your device becomes unresponsive for some unknown reasons and a DFU restore will be a quick way to bring iPhone back to normal. But accidents do occur when trying to exit DFU mode, it gets stuck and becomes totally bricked. iTunes is still the first choice but not the most effective one. Zoom is a helpful feature in iOS as it makes it easier to read text and view passages, especially for the elder generation. Nevertheless, it also can be a source of frustration when it gets stuck. In this case, you can see zoomed screen and won’t exit when tapping on it. The recommended way in the Apple community is to double-tap on the zoomed screen with three fingers, but sometimes it just fails to work. If you have upgraded to iOS 10, one of the improvements you might notice is the Music app. The totally redesigned interface offers you cleaner and simpler experience. However, some users ran into the shuffle mode and cannot turn off the Music after trying all the available methods. In this case, they may resort to a third-party tool. The symptoms of mute mode are pretty evident, when you change the volume level it won't increase any volume but only give you a notice saying "ringer (headphones)". You should try to clean the headphone jack manually, if the problem still exits, you may need a little expert assistance. Most of the iPhone users may have never heard of safe mode as this is only happens in jailbroken iPhone. Safe mode is used to protect your iPhone from destroyed and remove corrupted processes. Sometimes incompatible packages will cause iPhone stuck in safe mode and become unresponsive. Remove erratic package would be the way to go. This is another common problem that many iPhone users have met especially after iOS updating or jailbreak. Some people think their device is ruined when the apple logo appears and won't disappear. Actually this is really not that serious. Try to put iPhone into recovery mode or DFU mode can fix this issue in most cases, but it may erase some of your precious data. This is also called black screen of death. If you search the solution in the internet, most of them recommend restarting or resetting your device, but I don't think a restart can fix this as the reason for the black screen is usually hardware problem or firmware hitches. Similar to the black screen of death, iPhone blue screen is also one of the common screen stuck cases. But the reasons for this stuck is usually due to app problems or applications incompatible. To fix this error, you really need some professional help. When this problem occurs, the screen of your device becomes totally white and isn't showing any icons or apps. iPhone white screen of death often caused by dialed software update or hardware problem and not easy for users to fix. After a while, click "Exit Recovery Mode" to get the device out of recovery mode. The two steps above can fix a lot of stuck issues, but if it failed to get your device back to normal, you need to give your iPhone full repair. Choose “Fix All iOS Stuck” and then click “Start” to go on. Now you'll be the download page. Tap "Download" to download the latest firmware package. After downloading, right click "Start Repair" to repair operating system. 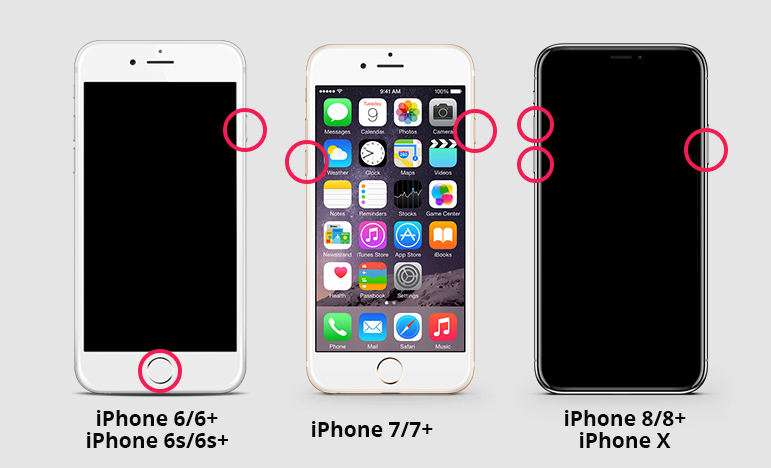 Now you must get a clear understanding of iPhone stuck mode and screen unresponsive problems. With Tenorshare ReiBoot, you can get rid of all iOS stuck issues easily!